Orlando Cepeda breaks into the majors with a home run. Willie Mays drills four homers in a single game while sick to his stomach. Felipe Alou prays for a ninth-inning miracle with the National League pennant on the line. 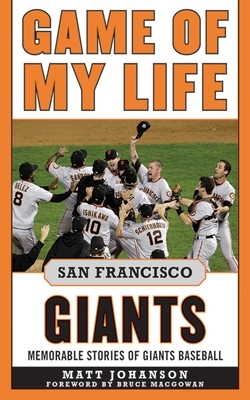 In Game of My Life San Francisco Giants, you’ll experience the exceptional moments of fan favorites Will Clark, Rich Aurilia, Robby Thompson, and Rod Beck, as well as current stars like Tim Lincecum, described in their own words as only they remember them.